Just as an airplane has a nice curve to it to allow it to perform as it should, our spines should have an observable curve when viewed from the side. When you look at the spine from the front, it should be straight or vertical. From the eyes to the belly button to the tail bone it should be straight. When you look at the spine from the side, however, from the ear to the shoulder to the hip, then a spine has a curve. Our spine is curved to provide for better movement. Our spine is curved to provide for better movement. Think of it as a shock absorber, with a curve that’s better able to withstand stress. That’s why an airplane isn’t built like a box. Just think of the stress that’s put on our spines. Whether it’s from jumping up and down or going for a walk, the spine takes a pounding from going up and down or just from gravity. 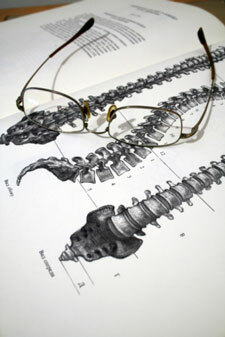 Think of the spine as being like a spring that’s able to absorb that stress. Bottom line: when our spines have great structure, curves are in the right position and the body can take the stress on better. If we lose our curve, then the body’s going to try to throw in some extra support to the structure by adding some bony calcium deposits that make bone spurs. People who start to lose the curve in their spine start to have more bone spurs and more arthritis in those areas where the nerves come out. Nerve signals don’t get out quite as well, and that can cause some symptoms that those nerves control. These include muscle tightness, headaches, neck pain and back pain that come from losing some of the curve. Having regular chiropractic checkups can help you maintain your structure and enjoy better overall health.